ANNAPOLIS, Md. (AP) — Navy is handing the keys to its triple-option offense to Malcolm Perry. He was the starting slotback for eight games last season before coach Ken Niumatalolo switched him to quarterback to spark a struggling offense. The 5-foot-9, 185-pound speedster did just that, rushing for 282 yards and four touchdowns against SMU. 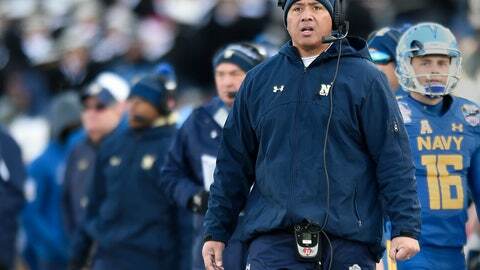 That, along a 250-yard rushing effort against Army and Navy’s 49-7 win over Virginia in the Military Bowl, was enough to convince Niumatalolo to make the move permanent. Perry is a threat to go all the way every time he touches the ball and playing quarterback merely increases those game-breaking opportunities. Perry rushed for 646 yards and seven touchdowns in three starts at quarterback, along with 536 yards and four touchdowns as a slotback. Blessed with an impressive combination of speed, quickness and elusiveness, Perry broke four touchdown runs of 65 yards or more last season. His 92-yard scoring scamper versus SMU and 91-yard touchdown run against Air Force rank as the second- and third-longest runs in school history. Perry and the Midshipmen intend to put up plenty of mileage this season, most of it off the football field. Navy will log an estimated 26,496 miles to play five road and two neutral site contests, second-most of any program in the Football Bowl Subdivision. Only Hawaii will travel farther. The Midshipmen open the season with a 9,706-mile trek to Honolulu for a game against Hawaii. The Midshipmen are taking a direct commercial flight that is expected to last over 10 hours. While Perry is a proven threat as a runner, his passing ability remains in question. He completed 1 of 2 pass attempts last season and did not look very comfortable setting up in the pocket. Most times that Perry dropped back, he wound up tucking the ball and running. Offensive coordinator Ivan Jasper, who has been tutoring the quarterbacks at Navy for 17 years, made Perry’s improvement as a passer the top priority. Zach Abey rushed for 1,413 yards in 2017, the second-highest single-season total in Navy history. Napoleon McCallum set the school record in 1983 with 1,587 rushing yards and was promoted for the Heisman Trophy the following year. Abey was rewarded for his performance by being switched to wide receiver. Abey, who set a Navy record by rushing for 100 yards or more in eight straight games, will continue to play quarterback in certain situations. The strategy is designed, in part, to reduce the wear and tear on the slender Perry. “We have to be smart, which is why we have a plan for Zach to handle the short-yardage and goal-line plays. That is what Zach is really good at,” Jasper said. This year, the game is being held in San Diego. The Midshipmen will fly more than 5.300 miles for that contest. Navy’s other road games this season are at Air Force in Colorado Springs (estimated 3,366 miles), Southern Methodist University in Dallas (2,734), Tulane in New Orleans (2,250), Central Florida in Orlando (1,764) and Cincinnati (1,084). That makes the neutral site matchup with Army, a two-hour bus ride to Philadelphia, look easy by comparison. Navy has enjoyed tremendous stability in terms of coaching staff. During his 11 years as head coach, Niumatalolo has only needed to replace a handful of assistants. This past offseason, however, defensive line coach Shaun Nua left for Oregon State and offensive line coach Bryce McDonald joined Chip Kelly’s staff at UCLA. Fortunately, Navy was allowed to add an extra assistant by virtue of an NCAA rule that applies to service academies. During the offseason, Niumatalolo brought in three new assistant coaches — two of them returning for a second stint at Navy. Joe DuPaix (slotbacks) and Tony Grantham (defensive ends) both served on the staff previously. Sione Po’uha was hired to replace Nua. Navy was picked third in the West Division of the American Athletic Conference in a preseason poll of media. Memphis is favored to repeat as West Division, and Houston was tabbed second.